The eight Alberta Métis Settlements are the only government-recognized Métis land base in Canada. Comprising 512,121 hectares, the settlements are located in east-central and northern Alberta. These settlements emerged from the activism of Métis political leaders in the 1920s and ’30s who were concerned about the social plight of landless Métis who struggled to feed their families. An earlier federally operated Métis settlement in Alberta — St. Paul des Métis — had been dissolved in 1909 for public homesteading after only 10 years of operation. Frustrated at the lack of self-government in these settlements, a group of activists formed the Alberta Federation of Métis Settlements in 1975. In 1932, the Métis Association of Alberta was formed from an earlier Métis political lobby. The new association lobbied the Alberta government to investigate the miserable living condition of the province’s Métis. Their efforts convinced the government to act. In 1938, the Alberta government passed the Métis Population Betterment Act, which, based on the recommendations of the Ewing Commission, established a land base for the province’s Métis. The new settlements, or “colonies” as they were then known, were: Buffalo Lake (Caslan), Cold Lake, East Prairie, Elizabeth, Fishing Lake (Packechawanis), Gift Lake (Ma-cha-cho-wi-se), Kikino (Goodfish Lake), Marlboro, Paddle Prairie (or Keg River), Big Prairie (now Peavine), Touchwood and Wolf Lake. The original governance structure was paternalistic; government and church officials had the largest say in governing, although the Métis had limited self-governing authority relating to hunting, fishing, and trapping. Four of the original settlements — Cold Lake, Marlboro, Touchwood, and Wolf Lake — were later dissolved. 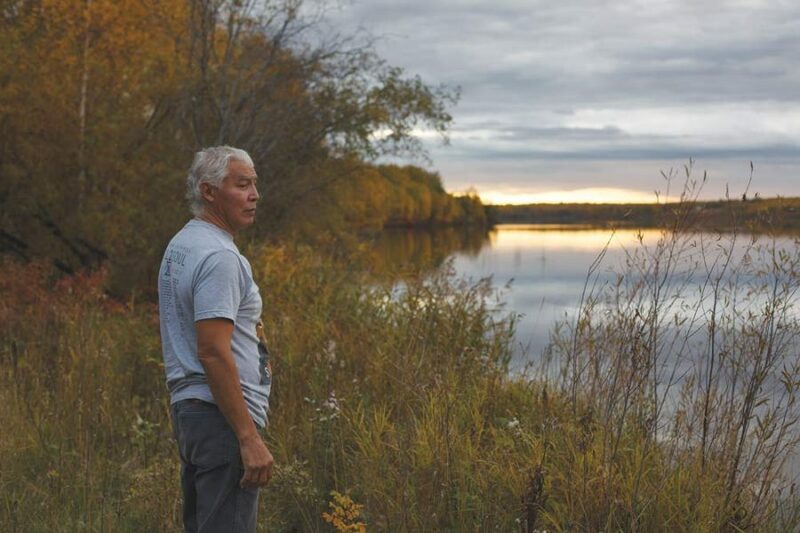 Harold Blyan, vice-chairman of Alberta's Buffalo Lake Métis Settlement, looks out over the water near his home. Frustrated at the lack of self-government in these settlements, a group of activists formed the Alberta Federation of Métis Settlements in 1975. After years of negotiations and the threat of legal action, their lobbying efforts were successfully realized in 1990 when the Alberta government passed the Métis Settlements Act, the Métis Settlements Accord Implementation Act, the Métis Settlements Land Protection Act and the Constitution of Alberta Amendment Act. With this legislation, the Métis on the settlements were granted control of 512,121 hectares of land. 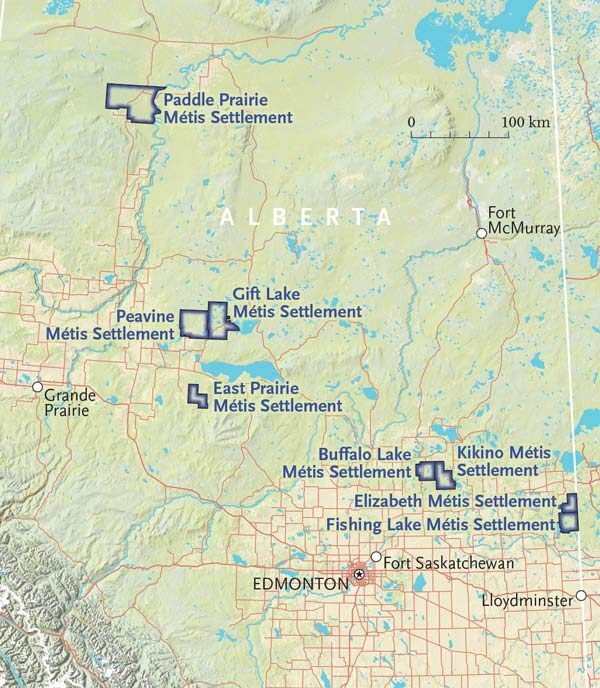 Map of modern-day Alberta Métis settlements. In 2016, the Alberta Métis Settlements contained 5,054 residents. The eight current settlements are: Buffalo Lake, East Prairie, Elizabeth, Fishing Lake, Gift Lake, Kikino, Paddle Prairie and Peavine. These settlements are self-governing and administered by the Métis Settlements General Council. Each settlement has a council, and the eight councils meet and hold an annual general council assembly. A board of directors oversees the MSGC and includes the eight settlement chairpersons and all four MSGC executive members, who are non-voting members. In consultation with the Alberta Minister of Indigenous Relations, the MSGC makes policies that are binding on the settlements. Rehabilitating Saskatchewan’s dispossessed road allowance people was a primary concern for the provincial government from the 1930s through the 1950s. In 1939, Saskatchewan’s Liberal government and the Roman Catholic Church created a Métis farming or “rehabilitation” colony in Green Lake, which forcibly removed some Métis from their southern road allowance communities and put them into a segregated northern community. Green Lake was a pre-existing Métis settlement with land set aside in 1902 by the federal government. In 1944, the new Co-operative Commonwealth Federation wanted to ameliorate the Métis’ destitution by establishing a series of segregated Métis rehabilitation “farms” in the province’s south, where it was envisioned that eventually, after learning to farm, the Métis could better integrate into the larger society. In 1945, the government purchased the Oblate-run Lebret Métis farm and used it as a model for subsequent farms in Baljennie, Crescent Lake, Crooked Lake, Duck Lake, Glen Mary, Lestock and Willow Bunch. All told, 2,500 road allowance Métis lived in these Métis farms during their height. Perhaps the most notable example of government paternalism towards the Road Allowance People occurred in 1949. In that year, the CCF government loaded many southern road allowance Métis, largely from “Little Chicago” in the Lestock area, into “special” railway cars in an attempt to settle them at Green Lake. While the Métis were aboard the train, many watched in horror as local government authorities burned down their homes. This program of moving southern road allowance families to Green Lake continued into the mid-1950s, when a number of families were moved from Lestock, Glen Mary and Baljennie. Marred by mismanagement and rampant paternalism, the Métis farms were an abject failure. The Métis had no input into their governance, and government officials were often arbitrary, unhelpful, racist, and likely using the Métis for cheap labour. More importantly, the government did not understand that the Métis preferred wage labour employment to farming. By the late 1950s, it was clear that the farms were not working; southern Métis were moving to the cities to look for wage labour opportunities, while those living on the farms often subsisted on government relief. Not surprisingly, most of the Métis eventually abandoned the Métis farms, and the government moved towards integrating the southern Métis into the province’s cities. However, as late as the 1970s, homelessness, housing and property ownership were still matters of grave concern for the province’s Métis.